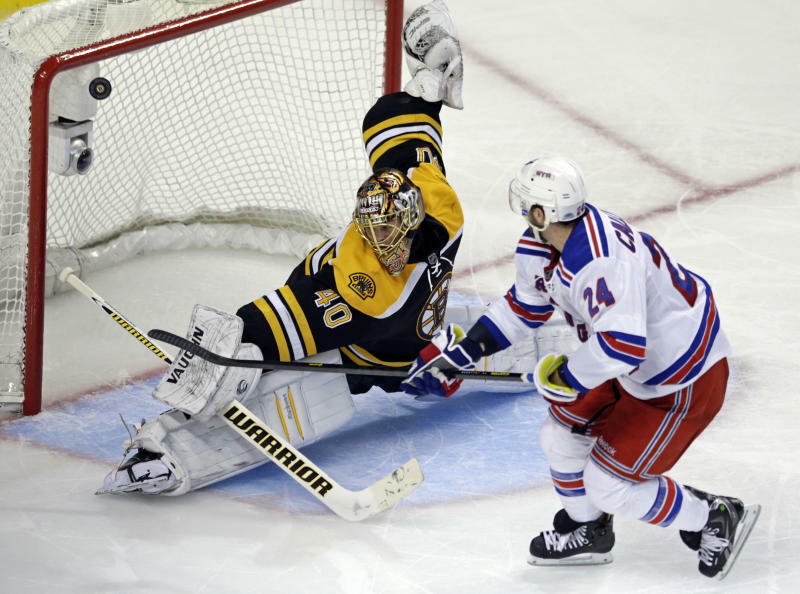 BOSTON (AP) — Claude Julien decided not to give his goalie a pep talk after a pratfall in the crease handed the Rangers a goal that had the potential to turn the series around. 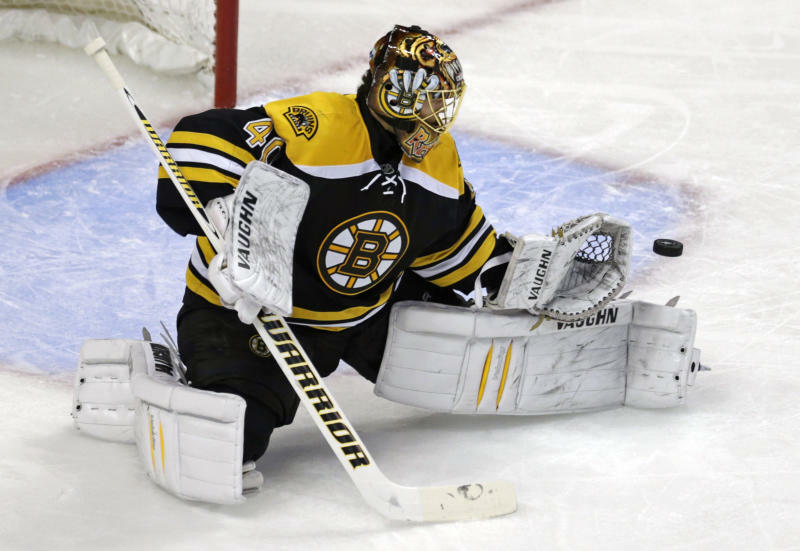 Instead, the Bruins coach waited until after Tuukka Rask responded with 28 saves to help Boston beat New York 3-1 in Game 5 on Saturday and advance to the Eastern Conference finals. "That's what I told Tuukka at the end of the game, 'You can start laughing now,'" Julien said after the Bruins followed their seven-game series against Toronto by avoiding a nail-biter against the Rangers. "We probably played with fire in the first round and almost got burnt," Julien said. "We knew we couldn't let our guard down (against New York). Because if we did, they would come right back at us." Gregory Campbell scored twice and recent call-up Torey Krug scored his fourth goal of the series for Boston, which will meet Pittsburgh for the right to play for the Stanley Cup. The Bruins reached the third round of the NHL playoffs for the second time since 1992. The other was 2011, when the Bruins won the sixth Stanley Cup in franchise history. Tim Thomas was in goal then, and Rask's playoff memories aren't quite so fond. The 26-year-old Finn was the Bruins' starter when they blew a 3-0 lead in the 2010 East semifinals against Philadelphia, giving up a 3-0 lead in Game 7 as the Flyers advanced. Boston was up 3-0 in the second-round series against New York this year, with a 2-0 lead in Game 4 when Rask tripped on a rut in the crease and flailed at a slow-moving puck as it rolled over the line. 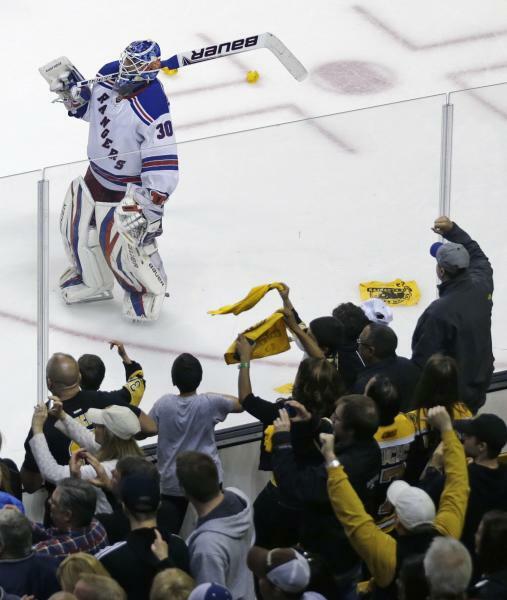 The Rangers went on to win 4-3 in overtime, forcing the series back to Boston for a fifth game. "We wanted to make sure we ended this series — for all the right reasons," including rest for players who went to overtime in Game 7 against Toronto, Julien said. "It also gives Tuukka the opportunity to laugh about that goal." Rask made sure there wouldn't be another collapse, stopping Ryan Callahan on a breakaway with just under 10 minutes to play. Callahan split the defense and went to his backhand, but Rask turned it away with the blocker on his right arm. "As a goalie, you expect to make one or two big saves. And today it happened," Rask said. "I didn't feel bad about myself after Game 4; obviously, there was a little screw-up there with that goal. But I didn't let that bother me, and I felt like I played a decent game after that. "Coming in today, I just wanted to be rock solid back there, and give our team a chance to win the game." Campbell broke a 1-1 tie in the second period, then added an empty-netter with 51 seconds left to clinch it after Henrik Lundqvist was pulled for an extra skater. Lundqvist made 29 saves and Dan Girardi scored for the Rangers, who lost to New Jersey in last year's East finals. "I expected more from us, and I hoped for more," Lundqvist said. "Right now, it's just an empty feeling, and disappointment. Some years you don't really have a chance to go that far in the playoffs, you just battle hard. I think this year, we had a pretty good team, but there were a few games when we didn't reach our top level. When you play a team like Boston, it's going to be tough to beat them." The Rangers fell behind 3-0 in the series before winning Game 4 on Thursday night to avoid a sweep, thanks in part to two soft goals that caught Rask off-guard. They took an early lead on Saturday, but they could not send the series back to New York for a sixth game. "I watched our team fight tonight to extend this series. We get it on a big guy's stick with a chance to tie it," Rangers coach John Tortorella said. "So it goes. They were the better team. They deserved to win." Girardi made it 1-0 on a power-play goal with 9:21 left in first, one-timing a pass from Mats Zucarello into the net. The Bruins scored a power-play goal of their own 3:48 into the second when Krug took a pass from Tyler Seguin and hit the top of the net. Notes: The Rangers had been 3-for-42 in the playoffs on the power play, but they scored on one for the second straight game ... Krejci led all scorers in the playoffs (5G, 12A) entering Saturday's game. ... Bruins D Dennis Seidenberg, who was injured in the first minute of Game 7 in the first round, returned to the lineup. Dougie Hamilton was a scratch. ... Rangers F Brad Richards, the 2004 Conn Smythe Trophy winner, was a scratch for the second straight game. ... Rangers F Derek Stepan took a puck in the face in the first period and skated off but returned a short time later.